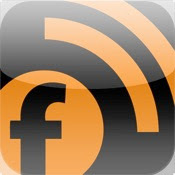 Feeddler RSS Feed: Blogaway, blogaway - I will follow! These are apps (iPhone, iPod Touch, iPad) that I recommend to bloggers everywhere, especially novice bloggers like, say, the ones operating the new blogs on the CreComm Blog Network (click through the link and look for "Class of 2012" in the column on the right side of the page). My colleague Melanie Lee Lockhart does the same here and here. BlogPress – $2.99 - mobile blogging from your iPhone, iPad, iPod Touch. WordPress – Free! - same deal, but for WordPress blogs. FeeddlerRSS or any RSS feed app – $1.99 - you sign in with your Google account, and it becomes easier to read all of the blogs you follow whenever they get updated. It’s how I can read 150 students' blog posts a week. Box.net or Dropbox –Free! - to help you store information and files for later. Dragon Dictation – Free! - converts your words to copy. Insanely accurate! Instapaper – Free! - syncs stuff you see on the Web to your mobile device, where you can “read it later.” The digital scissors for your online newspapers. Evernote – Free! - a great notetaking and ideas app. Echofon, Twitter, TweetDeck, Twitterrific – and more! – Free! - to publicize your blog and post messages on Twitter. All of the first-year CreComm students will be up and running on Twitter by the end of next week. You really only need one of these apps, but Twitterholics might want all of them. LinkedIn – Free! - Facebook for professionals. You can sync it to Twitter and your blog. AudioBoo – Free! - post podcasts and audio messages to Twitter, and embed them on your blog. Perfect for radio junkies. Facebook – Free! - you’re on the website, right? I'm not - "it's complicated." Why not download the app to make it easier to post and follow updates? News apps – mostly free! - stay up to date with the Globe & Mail, the New York Times, BBC, Telegraph, Huffington Post, NPR, PressReader, Fluent News and Winnipeg Headlines – a dude who steals from the Free Press, the Sun, and CJOB and gives to the poor: us! Apps related to your blog topic – just do a search of the app store to see who else is talking about your topic. Download the apps and follow them to become an expert on the topic. Did I miss any? If so, post 'em in comments. I have the free version of Feeddler RSS, and I'm not sure how much I'm missing, but it works well for me. I may upgrade sometime in the future. I'm currently installing Dragon Dictation. I'll have to play around and see if I'll be able to dictate drafts of my blog entries. Thanks for the recommendation! I use the Wikipedia app quite a bit. I like looking things up while I'm watching movies or whenever I come across something interesting, so it's a real time saver. Oh, yeah: did you get the IMDB app? I use it all the time! I do have the IMDB app and it is great! Another really good one is Flixter. I use it to look up movie showtimes! I fully co-sign on the Evernote app. I access it via the app, on my desktop, and the web. It's one of those "where have you been all my life?" things.